Thane (Maharashtra), April 6 (IANS) The toll in the collapse of a building at Thane rose to 72 Saturday, an official said. "The death toll has shot up to 72 as more bodies were pulled out from under the rubble between last night and this (Saturday) morning. 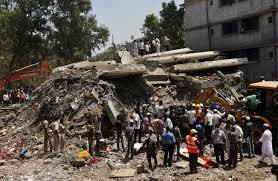 Over 35 people are still in hospital in a critical condition," a Thane disaster management official told IANS. A seven-floor building in Lucky Compound, in Shilphata area on the outskirts of Thane city collapsed around 6.30 p.m. Thursday. The unauthorised building had been constructed in just three months, without the relevant permissions and certificates. Police have registered a case of culpable homicide not amounting to murder against the two builders, Jamil Qureshi and Salim Shaikh, who have gone missing. Another builder, Adnan Seth, involved in the construction of the building, is also on the run. Chief Minister Prithviraj Chavan Friday announced the suspension of two officials. Chavan also announced a probe to be conducted by an additional chief secretary of the urban development department. Thane Municipal Corporation deputy municipal commissioner in-charge of illegal constructions Deepak Chavan and the local senior inspector of police K.P. Naik were placed on suspension for ignoring the unauthorised building that had been constructed in the area falling under their jurisdiction. Disaster management and fire brigade officials continued the rescue operations Saturday. Many children were rescued and given critical medical care. At least 12 children have succumbed to their injuries in the incident, police said. While civic officials admitted to the building being unauthorised, they shifted the blame on the builders, who they said went ahead with construction despite not having relevant permissions. A civic official confirmed reports that the building had been constructed on forest land. An official in the forest department, however, said that the building had come up on land that was privately owned.